Visit with Lizz! Listen to her author interviews, courtesy of The Bookcast! Lizz with and adorable fan. 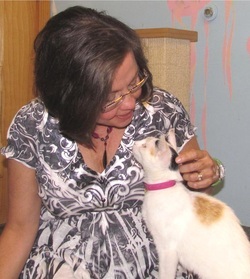 Hanging with a "fan" at the Kitty Colony room in the Lancaster Humane League. Stop by and visit - and adopt your best friend! Lizz Lund loves Lancaster. Since 1999, she's been having a terrific time here and thinks everyone else should, too. She is a newlywed and head-over-heels about her chef husband; she made him move from New Jersey, too. Kitchen Addiction! is her first novel of the Mina Kitchen series. Lizz grew up in Glen Rock, New Jersey and still hasn't recovered. She holds a BA in Musical Theatre from Syracuse University, but has never learned to waitress.